A monumental collection of antique shoe cobbler and leather working tools, Civil War items, cast iron, primitives, advertising display cases and 1000’s of other items. This will be a huge auction. We will be running 3 auctioneers at the same time. 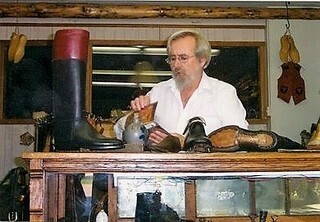 After over 40 years of traditional and historical shoemaking, Cliff Pequet of Shipshewana, Indiana, one of only 25 remaining cordwainers in the country, is selling the contents of his home, his business, and his shop — The Sign of the Boot Leather Shop at the Center for Traditional Arts. This hidden gem of the Shipshewana downtown and area was more like a museum than a store, more like stepping into the aura created by 18th and 19th century artifacts and antiques, than shopping. Cliff’s reverence for and dedication to keeping the historical trades, skills, ingenuity, and crafts alive, in general, and his practiced trade of making high-quality hand-stitched leather shoes and boots, in particular, was at the heart of his store. Cliff Pequet came to his interest in leather after meeting and working with Ezra Harshberger in Middlebury, Indiana. For about a year Cliff went off to study at Cordwainers’ College in London and to tour leather shops in England. He returned to work at Sauder’s Village and Living History Museum in Archbold, Ohio for five years. There he set up a cross-museum exchange with Colonial Williamsburg, the world’s largest living museum, to share knowledge, teachings, and skills between the two institutions dedicated to bringing history to life. His dream: to inform the future by keeping the past alive and vibrant. Cliff opened his shop on Morton Street in Shipshewana in about 2000. He has had the privilege of making boots and leather-goods for museums, re-enactors, and he even provided the handmade period-authentic boots for Mel Gibson’s Hollywood movie, The Patriot. AUCTIONEERS NOTE: This is a huge auction in which we will be running 3 auction rings. Similar items will be in each ring so bring a friend and a truck. There are 100’s of items not listed. Visit our website for 100’s of photos. National M311 brass candy store cash register restored, 4 cast iron mechanical banks, Victorian framed hair art, 3 leather fire buckets, bearskin rug, Large brass steam engine lubricator, antique oak country store revolving drawer cabinet, 8’ country store curved front nickel plated display and other nickel plated display cases, numerous antique wood country store display cases some with advertising, early tin lanterns, Griswold #7 French waffle iron, antique forged kitchen utensils, salesman sample stoves, pair of antique wrought iron sign brackets, leather items made by Cliff including a small number of shoes and boots, 3 US McClellan saddles one fully restored, confederate style Morgan muley saddle, Spanish American war child’s uniform, CIVIL WAR: 4 muskets and 3 Civil War swords, 50+/- Civil war cdv and tintype images, bullet molds, Indian wars belt, canteen, cap pouches, 2 Indiana Civil war rosters, 3rd Michigan Calvary unit history book, horse bit, antique knives, numerous antique powder flasks and horns, Civil war boots from Michigan soldier, Civil war cannonball, Japanese tanto, horse brasses, rosettes, spurs and stirrups including military, 1874 Elkhart county plat book, 50+ pieces of stoneware, butter churns, 25 gallon redwing crock, 1800’s scroll flasks and other old bottles, double wheel cast iron coffee grinder, Dr. Scholl’s store display, original harness company and leatherworking equipment catalogs, large set of antique wood storage drawers, cast iron banks and toys, tramp art items, wooden folk art pieces, brass telescopes, 5 1800s rocking horses, large number of saddles and horse tack, side saddles, antique framed prints, glass display domes, sets of antique sleigh bells, horse bronzes, Indian stone artifacts, Indian beadwork, Indian pottery, western items, 2 leather fire helmets, several early hide covered trunks, antique wood crates and storage boxes, 3 equestrian show chests, walking sticks and folk art canes, 10 antique barrels of various sizes, antique carpenters tools, early Shaker chair with mushroom handholds, antique sleds, brass buckets, lightning rods & balls, snowshoes, wood skis, pocket watches, round oak stove, Kalamazoo brilliant stove, Woodstock soapstone wood stove, psychedelic painted 1960s surfboard, windmill, aluminum canoe, hanging oil lamps, 8 acoustic guitars, 2 early and rare Pearson & Bennion Sewing Machines one with original cast iron base, Durkopp 17-1-1 sewing machine, large upright Champion 50 Sewing machine, Large Champion 30 Sewing Machine Pedal powered with heavy legs and cast iron seat. Rare Early Champion Treadle powered leather sanding line shaft, 2 Simanco 16w 200 sewing machines, US Blind Stitch Co B88 sewing machine, 2 Singer 51w 56 sewing machines, Singer 11-37 sewing machine, Singer 16-88 sewing machine, Singer 17-1 sewing machine, Singer 78-3 sewing machine, Consew sewing machine, 3 Belt creasers, large leather sanding line shaft and parts. 4 very unusual Antique Boot Front Creasers, wooden shoe lasts, CS Osborne leather splitter, American shoe sole compressor, 100+/- rolls of leather, large amount of leather scraps, many small pieces of leather working and shop equipment, large number antique leather stitching benches and primitive wood stitching clamps, several wood cobblers benches, early foot powered wood mortising machine, 4 large anvils and several smaller anvils of various sizes, blacksmithing tongs, blowers, post vises, 2 forges, blacksmith hardy tools, large fancy upright blacksmith blower rough condition but very unique and fancy, 6 cast iron harness makers nail cups, 14’ antique solid wood harness makers bench, two other antique wood carpenters benches, large amount of harness buckles and hardware huge number of smalls and other items to extensive to list. The owner Cliff Pequet was one of the few remaining traditional cordwainers left in America and there are many rare and unusual items specific to his trade.